Each year the Minnesota Recreation and Park Association selects a handful of community leaders to honor for their hard work and professional dedication during their annual awards ceremony. The highest professional honor given by the association is the Clifton E. French award. It is awarded only to individuals who have 20 or more years of outstanding service within a parks and recreation division. 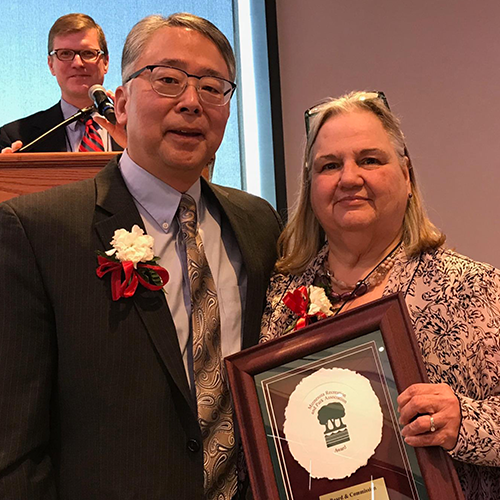 We are honored to share that the 2018 award was given to former Ramsey County Parks & Recreation director, Jon Oyanagi. Oyanagi retired as the Ramsey County Parks & Recreation director in September 2018 following 38 years of dedicated public service, four of which he spent at Ramsey County. Gale Pederson, current Parks Commission member, was also honored at the award ceremony. She received the 2018 Board and Commission Award. This honor is given to a member of a citizen’s advisory or policymaking board in the parks and recreation field to recognize them for their excellent or unique accomplishments. Gail has served on the Ramsey County Parks & Recreation Commission for 14 years and served as chairperson for six of those years. Both Jon and Gail are well deserving of the awards they received. Posted on Tuesday, January 22, 2019 - 8:57 a.m.